Research in the history of archaeology has included women; but it has often emphasised archaeological field-work and excavation over other endeavours. But women also collected and curated archaeological artefacts, and their active engagement in this work is often under-appreciated in scholarship. 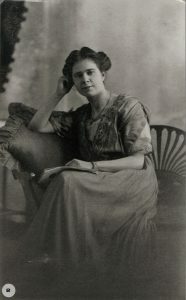 Established in the early 20th century, the Ure Museum’s history is full of women, including its first Honorary Curator, Annie Dunman Hunt Ure (1893-1976). Underpinning the antiquities in its cases is the story of women collecting, arranging, cataloguing and passing on archaeological knowledge. These women appear mainly as names in the museum archive, but what are their personal histories? What formal or informal roles did they have in museums? How can we ensure that these histories are rescued, recorded and promoted? What archives and documents remain to begin to understand women’s contributions to the museum sector? This workshop will draw together research on the women behind archaeology collections in the UK during a pivotal period in the history of archaeology and the evolution of museum collections. It will also serve as a springboard for a network to identify research themes and archives to help unpack this hidden history y. We invite submissions of 150-word abstracts for 15-minute presentations for a workshop to be held on 12 June 2019 on any aspect of women collecting and curating archaeological collections (formally and informally) in the 19th and 20th centuries. We also welcome 75-word abstracts for 10-minute spotlight talks on research-in-progress. Please include in your submission a 50-word speaker biography. Doctoral students, curators, archivists, museum staff, and independent scholars are warmly welcomed. Deadline for abstracts is 22 April 2019. Please send abstracts to Amara Thornton (Research Officer, Ure Museum of Greek Archaeology, University of Reading) at amara.thornton@reading.ac.uk. Enquiries on submissions should also be sent to Amara.